The Institute for Transportation (InTrans) at Iowa State University initially completed work on an in-depth study of crash history on low-volume, rural roads in Iowa in December 2010. Results indicated that unpaved roads with traffic volumes greater than 100 vehicles per day (vpd) exhibit significantly higher crash frequencies, rates, and densities than any other class of low-volume road examined, paved or unpaved. The total mileage for this class of roadway in Iowa is only about 4,400 miles, spread over 99 counties in the state, so it’s certainly a manageable number of miles for individual rural agencies. 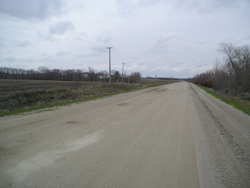 The purpose of this study was to identify and examine several unpaved, local road segments with higher than average crash frequencies, select and undertake potentially-beneficial mitigation, and evaluate the results as time allowed. A variety of low-cost options were considered, including engineering improvements, enhanced efforts by law enforcement, and educational initiatives. Using input, active support, and participation from local agencies and state and Federal safety advocates, the study afforded a unique opportunity to examine useful tools for local rural agencies to utilize in addressing safety on this particular type of roadway.